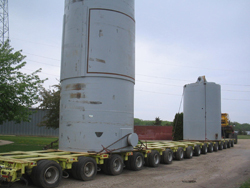 Work continues, to dismantle a defunct nuclear reactor in western Wisconsin. Sometime this summer, the nuclear reactor core at Dairyland Power Cooperative&apos;s Genoa site will make an eleven hundred mile rail journey to South Carolina. Dairyland&apos;s manager of corporate communications, Deb Mirasola, says when exactly that happens is not public information, due to homeland security regulations. Plant manager Roger Christians says concrete from the reactor core awaits shipment to Utah. The reactor vessel, encased in steel and concrete, weighs 320 tons and rides on two special rail cars. According to the group Nukewatch , the train will pass through several metro areas, including Dubuque, Nashville and Atlanta, en route to the South Carolina site, where it will be buried.